There's a pretty simple rule when it comes to using public swimming pools: don't pee in the water. But at the Rio Olympics, it's perfectly normal. While few people will openly admit to peeing in the pool on an everyday basis, athletes like Michael Phelps have stepped forward saying that it happens, they did it, and there's no reason to feel regret. 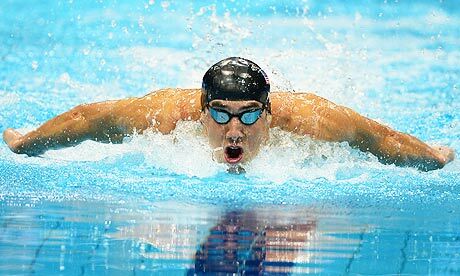 "I think everybody pees in the pool," Phelps said back in 2012, stating that he and his fellow swimmers find it completely normal. "When we're in the pool for two hours, we don't really get out to pee. We just go whenever we are on the wall." Phelps' reasoning behind the easy-going attitude of his colleagues (outside of the fact that, again, it's pretty unavoidable) is simple: "Chlorine kills it, so it's not bad," he told the Wall Street Journal. Phelps, other swimmers, and everyday folks have come to accept this as fact: that chlorine helps dissipate urine so that it's not dangerous. Sure, you can pee in the pool or swim around in pee, but doing so is somewhat akin to eating bread that fell on the ground under the 10-second rule: still gross and dangerous. While you may not be intending to commit a crime when you pee in the pool, the mixture creates a toxic chemical known as Cyanogen chloride, which has been classified as an agent of chemical warfare. The amount of pee needed to cause any actual harm to someone, though, is a lot higher than what's usually found in the Olympic village. Casey Johnston of Ars Technica conducted an experiment on the very subject, and says that it would take roughly three million people occupying one pool in order to kill anyone of cyanogen chloride poisoning originating from the mixture of urine and chlorinated water. So don't panic: there are tons of other completely gross things floating around in the pool that can make you sick, and though it's best to stick to etiquette -- which includes showering and emptying your tank before swimming -- there's no real way to avoid sweat, which accounts for 60%-98% of body fluid emission volume into pools. Like urine, sweat contains plenty of gross stuff like bacteria, dead skin, and creatinine. For the most part, we sign a contract saying that we're down for anything when we enter public pools, so do everyone a favor and stay away from the water if you need to pee, have open sores, or have anything even closely resembling a UTI. Let's Bring Tug of War Back to the Olympics!